Don’t forget to check out the Champions League draw post I put up a few minutes ago. If you’d told me that there would ever be a match where Adriano, Keita, and Maxwell combined to score 4 goals while no one else ended up on the scoresheet, I’d probably have told you that you might want to lay off the wacky tabacky because it’s messing with your internal sense-making devices. Turns out I’ve just been neglecting my own creative concepts producer by not feeding it with whatever psychotropic fun you’ve been able to get your grubby mitts on. I’ve stuck with chocolate and the occasional Dr. Pepper when things get desperate. And, as such, I was somewhat caffeinated (by my admittedly low standards) throughout viewing Barça’s demolition of Al-Sadd and not entirely focused on the match. But neither was Al-Sadd, so it’s not like I was missing a particularly interesting match. Was that the sound of Euler punching his monitor? It certainly sounded like someone attempting to reach through the tubes and strangle me for making such an anti-Pepian statement. The lineup that was put out there wasn’t really that close to full strength, but showed that Pep was taking the match very seriously. Valdes, Adriano, Puyol, Mascherano, Abidal, Keita, Iniesta, Thiago, Villa, Messi, Pedro were rolled out and it quickly looked like another match where the opposition was simply not up for it. Al-Sadd played virtually a 5-4-1 and put little pressure on Barça’s midfield while also forgetting try and hit the team on the break. Mamadou Niang was all by his lonesome up front, backed by exactly no one until the second half, when the game was already over thanks to two Adriano goals. That Adriano was able to have such an offensive impact is a credit to the consistency with which Keita defended and allowed the wing backs to make forward runs without worrying about a counter attack. Puyol and Mascherano were able to play a 2 man back line, with Keita dropping in sometimes to play backup, which is just silly. When the experienced Algerian international defender Nader Belhadj mishandled an imminently clearable cross from Pedro and pushed the ball sloppily to his keeper’s feet with Adriano bearing down on him, the Brazilian was gifted the simplest of goals. After that, the match settled immediately back into its previous rhythm, with Barça looking to slip silky passes through and taking the occasional shot. A ball over the top sent David Villa on a run and then his plant leg seemed to catch on the ground and pop went his tibia. He immediately signaled to the bench and there went his calendar year, certainly, and possibly the rest of his season. He’d been struggling with a long-term tibia injury according to Pep, which kept him out of a few matches earlier in the year (namely the L’Hospitalet CDR match), but he was doing fine and even play pretty well. Losing David Villa is a massive blow given his talent, creativity, and work rate. Pedro, who hasn’t been having the best of years, will have to step up and fill the void on that left hand side. Fortunately he looks like he’s coming back into form. With both Afellay and Villa out, it’s simply fantastic that Cuenca is available and playing at a high level. What a system we have that we can simply replace one world class player with another and then bring up a young kid looking like he’s destined for similar status. Absolutely amazing. The match continued with Sanchez replacing Villa. And in the 42nd minute, Adriano got his second by playing a quick interchange with Thiago and letting Sanchez make a darting run to hold the central defender just a split second while Messi confuses him by occupying the space available for another pass. That’s all Thiago needed to return the ball to Adriano in stride, who merely had to settle and place the ball around the keeper. Admittedly the keeper should have palmed it out, but he didn’t. That the right back was able to have such time and space in the attacking third was a credit to the movement all around him, especially in the center where Messi, Iniesta, and Sanchez were causing all sorts of organizational problems. At the end of the move, the defenders had no idea where anyone was, much less how they should get a foot on the ball. In the second half, there was a different tactical approach from Al-Sadd and Eric Wynalda rightly (!) point out that they should have played with more than 0 midfielders from the beginning. They retained the ball longer, pushed Barça back a little, and even created a few dangerous looking forward runs. And then Al-Sadd’s fear of Messi caused them to bunch formation around him and he simply passed through them in the 63rd minute to Keita, of all people, who, from the DM spot, was stepping up into the void created by other runs. That left him one-on-one with the keeper and he dinked it in for 0-3. Keita celebrated by running to Leo and lifting him up. It was a brilliant pass through the defense, but it was made all the easier by Messi’s darting little runs with the ball that terrified everyone into looking at him and ignoring everyone else. The defender ostensibly marking Keita was watching Messi 10 yards away even though Messi had 3 defenders around him. That little look, to see which way Messi would go, meant Keita won his shoulder and it was over from there. The ball just had to be put onto Keita’s feet. The scoring was rounded off in the 80th minute by Maxwell, who restarted a play with a quick ball to Thiago and then raced into the box for the return pass. No one was able to mark him since the right back was pushed up to mark both Maxwell and Iniesta on Barça’s left wing. Messi again had 2 markers and Keita kept a third occupied. So Maxwell just ran into the box, collected Thiago’s pass, and shot it beyond the keeper, who let him score on the near post. We’ve yelled at Valdes for similar against Milan, so I suppose it’s only fair to say that the third goal should have been saved as well. That’s 3 of the 4 goals that you can at least partially blame on the keeper. Not a good night for him. Overall, it was a lovely match from the squad. Negatives are Villa’s injury and now Alexis and Pedro are both fitness doubts is a doubt for the final. That could have a huge impact on what happens. Cuenca will start, I’m sure of it and so will Iniesta, Cesc, Xavi, and Busquets in the middle. It should be a lovely game and one full of piss and vinegar. Or something. So now it’s on to face Neymar in the FIFA Club Neymar Cup. Can’t wait to see the Neymar on Sunday! Sorry for the OT but I was Hlebbed. Thanks for replying. It’s always nice to hear your views and nice to know that you’re following this blog. I wish I could follow yours. Busi more defensive and short pass style, Alonso more leadership and long pass range. Alonso maybe has the better long range passing but that is pretty useless in the Spain NT set up when they are set to play the short pass slow tempo game. You also said it yourself later on. Can you explain to me what you mean by Alonso’s leadership. I mean he is not the captain. I think Casillas/Puyol are the leaders of the outfield pitch. Xavi through his dictating play and Puyol the leader for the defense. I understand why people would interpret Alonso’s ability to work in tight spots as not up to par, considering when he plays against Barcelona (a team that offers little space to operate especially since they mark Alonso closely), I think people miss an important point. The reason why Alonso struggles so much in tight spaces against Barcelona isn’t because he lacks technique, but rather a system error in Real Madrid. But we were talking about Alonso’s position in the Spain NT, not how he plays for Madrid vs. Barca. I quoted a comment about Alonso having no business in the midfield in the Spain NT which I agree. We all can see, I mean, even Madridstas (sp?) can testify that Alonso’s technique is the lowest in the Spain midfield, it is certainly not his top attribute. Take out Busi and put Alonso and you will get more fluent play (before someone attacks me and my mother, I’m not saying that should happen). Not as strong defensively, but still more fluent. I assume you’re being sarcastic but after reading the last sentence I doubt it. You do admit that Busi is better defensively but why do you think that it’s more fluid when Alonso is on the field? Why do you think that is will be more fluent? Now I’m not judging individually but from the handful of times that Busi is a lone DM for Spain NT, they looked more fluid compared to the times when Alonso is alone. Many people has said in in other blogs and here as well once or twice, Alonso takes away a spot of a more attacking minded player like Cesc, Silva or Mata. I hope VdB will try the complete Barca midfield one day of Busi-Iniesta-Xavi. That is the recipe for success. It has worked for Barca and should be the template for the Spain NT. Darn! My reply was Hlebbed too. Though I love the scrappy type of player Sergio is. Also doesn’t hurt being one of the best one-touch passers in the Seleccion. While we’re dishing on the NT, I would like to see Soldado slotted in as a Villa replacement. I like that Soldado now that he’s wearing the right kind of white. Always good to have a Batman on the squad. Well I think bringing Soldado in was inevitable given his form compared to their other strikers at the moment. Now, it is almost a necessity given Villa’s injury. Even if Villa will be back by then, VDB simply has to give Soldado a chance. He deserves it. Also, that was the worst goalkeeping I’ve seen in some time. The passing in the first 15mins was superb! Pep should’ve rested Messi at half-time because that was the only opportunity for him to rest. We have Santos coming up and the league will resume, no insurance that he will have time rest in the near future. So when there is an opportunity, grab it and sub him out Pep. Now Villa is out and Alexis is suspect so it would’ve been smart to rest Messi as he has a big burden to carry for the next weeks/months. We need him for that extra spark when the team is down. The commentator actually said that it will be a battle between Messi and Neymar in the final. Is he frickin serious???!!! I find it disrespectful to Messi and Iniesta & Xavi for not being mentioned. If Messi doesn’t play, Messi isn’t happy. But have you noticed that Leo has taken on the Ronaldinho stroll? He kind of meanders until it looks like something interesting might happen. He might as well be strolling to to the fridge. But when the ball starts to bounce around the midfield he turns it on, and how! With Dinho I always assumed he was hung over. But the Hunky Soccer Husband has suggested that this might be Messi’s way of conserving his bionic flux capacitator. You are right on a fun way! Just shows how badly people want to see Villa succeed here. Pedro? What’s wrong with Pedro? I haven’t heard anything about him being injured. I also want to point out to the people moaning about the CWC competition being somehow responsible for Villa’s injury–if he was already carrying an injury to his tibia, this may very well have happened in the next game he played anyway, whether in Japan or Barcelona. Jet lag doesn’t cause broken legs. Yeah, what’s up with that? I know we probably won’t have Alexis, and they were evaluating Masche, but I haven’t heard a thing about Pedro. Don’t mean to mom-out on you, mom4, but all I wanted to do when I saw Villa carted off the field yesterday was rush in with a cup of ginger ale and Davy’s favorite blankie. My heart went out to Doña Dorita! yeah no news on pedro, i think he is fine. he was interviewed on official site here: and he didnt mention anything. Apparently ain’t nothing wrong with Pedro. I misread an article about how he’d missed training and the words that clarified everything got all mixed up in my brain and came out backwards. What’s that clanking sound I hear? It’s the printing presses of Spain gearing up for Neymar overload this weekend! It was interesting to see Pep use Messi again as a 10 rather than as a false 9. Seems like Pep may be thinking that teams have finally adjusted to Messi playing as a withdrawn striker. Now they are designing their defenses around that principle. That’s what we saw from RM in the Spanish Super Cup. That’s also what Bielsa did in that match against Athletic club. Yesterday in the 3-4-3, Messi played where Pep has often used Cesc – at the tip of the diamond. No surprise – he’s great there also. And the role of the striker in front of him is to occupy two defenders and act as a point of reference for Messi to link up with. Puyol is really excellent at the right center half position in the three man backline. His experience at CB and reading of positioning allows him to play the large space required very well. I wonder if he had Puyol play again because he was resting Xavi and wanted to make sure 1 of the 2 was out there just to maintain level of play and express to the squad how important this trophy is. Adriano has turned into a wonderful player. What was so important about his contribution was that he was the player in the first half with the most time and space on the ball. And he was the one to make the defense pay for the tactical trade offs they chose to make. Also – yesterday we saw the value of having a player who is so good with both feet play in a wide position. Adriano is very good at crossing the ball – which he could do with his right foot. And then he cuts in to score that second goal with his left foot. I love Dani. He’s great. But he could not have scored that goal. Keita has gotten so much better at the DM role. His positioning is now correct – and that was his biggest issue prior. Now he plays as a true holding player. He’s struggled at DM in the past but he’s such an intelligent footballer that you had to hope he would pick it up quickly – that’s what Pep’s wager was because given the roster composition it was very clear that Masch was going to play a lot of CB which meant Keita would have to play DM. What I also liked about his game at DM against a side that parked the bus were his runs. The one for the goal was just great. You could just tell that he was reading the play into the future. Seeing Messi make one of those runs. Knowing that the defense would collapse around him. Really great football. That’s something I really wish Busquets would add to his game. At times, against teams that sit deep and don’t pressure, Busquets function gets diminished. The team is able to retain possession relatively easily. And Busquets lack to thrust (whether with runs or dangerous passes) limits what they can do. Busquets is brilliant. In a game like the last Clasico – he’s the best holding player in the world against that kind of defense. But he can still get better – I’d like to see him push himself more. Keita’s game at DM is also partly why I’d like Sergi Roberto to be tried at the holding role. I think he could be very good at that spot and add diversity. I agree with your view on Busi. I remember many people calling him to be Xavi’s heir including Kxevin but I never agreed with that because he lack that offensive threat. Both Yaya & Keita sometimes make a dash forward to the box but Busi is so content with sitting deep. Seems like adriano has been coming on more and more since the middle of last season. As you said, showing a skill set that makes him more than just a backup for both backs. Although, given the way the backs have been used this year that in itself would be a pretty hefty accomplishment. If he could just stay fit for longer periods of time. I think we are now seeing what pep saw in/for him. Might be proof that pep has been looking to push towards using wingbacks more often and 4 in the midfield isn’t just trying to cram cesc onto the field. You are dead-on about Keita and Busi being two different flavors of DM. I think that Busi might be helped by playing a few games further up the pitch with a DM behind him. It seems obvious but it bears remembering that busi has spent a considerable amount of time at CB over the last year, whereas Keita has spent his time not at DM as an offensive mid at least in a more traditional midfield roll. But it does beg the question of whether busi is too comfy in his roll and how always playing with xavi and iniesta in front of him is hindering his development. I will be interested to see how pep lines up in back for the final. Not as much about 3 versus 4, but whether puyol features. If he does that would be 3 games running in about a week. (plus a day or two for timezone math) You have to think he is chomping at the bit to shut down neymar a week after doing the same to ronaldo. He is still a monster! Did anyone else notice how terrified Cuenca was of his marker vs. Al-Sadd? He tried to dribble the guy in his 1st touch and was tackled and after that he didn’t even attempt to step forward when he had the ball. He kept on passing the ball back. Either he is not ready to face the big boys or he was scared as hell of that defender which I can imagine 😆 A big tough guy vs. a fragile skinny lad. He was pretty brave vs. the big Ballesteros in the Levante match though. After the injury of Villa, any kid would be more cautious on a almost won game. And let’s remember that in the last part, they were playing dirty and they almost injured Masche. I still can’t understand why teams other than EE choose to wear white against us. Apparently Andy Gray and Richard Keys are taking their particular brand of “banter” on the road and hiring themselves out for parties and such. Their flyer says they will answer “anything that’s thrown at them” from the floor. Can we have a whip-round and book them, please? I have a few things I’d like to throw. The advertising flier is the best. That’s just comedy gold. Just reading the comments now. I can’t believe people still think Gray was sacked because of his comments about the female referee. Have they completely forgotten the video of him sexually harassing his co-worker? That’s why he was fired. He might have gotten away with the “offside rule” comment as banter, but a company like Sky can’t be seen to tolerate actionable harassment like that. Rumour was there were lots more examples of harassment that would have been leaked if he hadn’t been sacked. 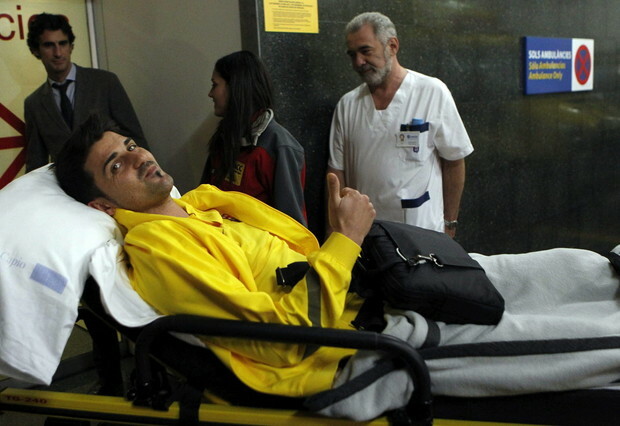 Iker showing that Villa is a good friend of his, and wishing a soon recovery is something great. He even called him before the facebook comment. finally back to my country. not able to see the classico so i just wanna watch the classico. with the net speed i have i prefer a torrent. can anybody please provide me a hd quality torrent. Always gotta be wearing your Barca gear, huh. This picture gave me a horrible flashback of me jamming a clothes-hanger down the side of my cast trying to get at the most excruciating itch ever. Looked like I was trying to snake a hair clog out of a sink. I hope the guy recovers quickly so he can hoist another orejona a la Abidal. Well the central lechera with Punto pelota leading the charge, are now saying that villa had a little crack on the tibia since november, and that there was a medical report from Barça informing this, and that it was irreponsible from Pep to making him play against Hospitalet, and giving him the opportunity of playing in the WC semi finals. Obviously this doesn’t make much sense, but they don’t need to make sense, to denounce and make noise hiding EE’s defeat and the possible WC cup we might win on sunday. a hd torrent of the classico,please. i havent seen any goals or highlights of the match. You might try this. I haven’t downloaded it. so I cannot tell about the quality. But the comments say that quality is good. You will be amazed to see our team’s mental strength. The FCB website is advertising tickets to the CDR game against Hospitalet at the unbelievable price of 8 Euros (4 Euros for members)! Quick! Maybe we can sneak over on one seat (we’ll take turns patrolling the aisles). 8 euros is a day’s lunch! Hesus. And you know that lots of socis won’t bother to go because it’s “just” Hospitalet and it will be mostly “just” the kids playing, so the place will be only be half-full, if even that. Meanwhile I would love a chance to see Rafinha, Sergi Roberto, Bartra and the rest in action. If they play even half as well as they did against BATE it will be worth watching. The stadium will be full of Hospitalet fans wanting to see their club play at Camp Nou. Can I get these engraved on my Christmas cards? Are there any Japanese cules on here? If so, can you please go to the hotel in Yokohama and swathe Iniesta in bubble wrap and cotton wool? I will reimburse you for supplies and travel expenses. Twenty best players in the group stages by BS.com average ratings. Messi is highest and Xavi is third, but most notable is the number #4 spot representative from Chelsea, a young defensive midfielder who apparently bossed the three vital CL games he started and is also now starting in the Premier League (including against City). I’m pretty happy with that. “it might be true that mikel has wonderful range of passing, but he dwells on the ball too much and that stops chelsea’s flow. in contrast, romeu’s passing is more adventurous, more direct and causes more problem to the opposition. just look at the city game on monday u will understand what i said. I’m guessing they mean a DM with reading of the game in Chelsea (or the EPL), not at all. But generally Chelsea fans seem really impressed. Leo Messi close-ups during the Classico. “Dinho stroll” mentioned before is present, but watch him come alive when he gets the ball! Glad that whatever “it” was, “it” was over before I got here. Hold on, fellas, I’m a little itchy … o.k. This video tells so many stories about Leo the person, Messi the legend and Barca the team.. It could be part of an Oscar-winning movie, but, get it, it wasn’t staged, it actually happened, and is a part of an even bigger story we are fortunate to witness. Sd makes a great point just below about the Madrid goal – I was watching the game, and my reaction as a fan was anger, fear, hope. You see none of that on Messi’s face. This unwaverable belief in himself and the team, ability to land on their feet and hit the ground running – this is it, up close, the difference between being great and being a legend. But there is more: here you see him, an observer, watching, waiting, not letting emotions show – but the ball goes near, and he changes – the explosion of energy, power, pure brilliance, magic! He runs, fearless, always half a step ahead, aware of everything on the field.. rides a tackle.. another.. is brought down. And this is also a story – Messi is not our most fouled player, because he is so difficult to catch and doesn’t go down easily. But for the same reasons, tackles on him are so brutal – you see the pain, the anger, but only once you see him argue with the ref – about a foul on someone else. And never once does he slow down or hesitate after the tackle, not intimidated. Towards the end, as the aches and fatigue accumulates, it’s tempting to sit on the ground a bit longer, to lower the gear – but this is the Classico, and so he gets up and does his thing. There is even more to look for – Reactions after the goals and missed chances, admission of guilt after the episode with Xabi Alonso, interaction with teammates. Parallels with the rival team can be drawn – but it’s not the point. There is Messi, and everyone else. Barca, and everyone else. This is a tale of gift, integrity and spirit. Watch it. Learn from it. lea, that was a great vid! it is amazing to me how Messi shows absolutely no emotion when Madrid score. It is a testament to Barca’s and Messi’s mental strength to take it as if nothing happened. This team is amazing! Even with all the plaudits I still think Guardiola’s influence on the strength of this team is underrated. Compare this to the response Madrid’s players had to the equalizer and then later to Xavi’s goal. 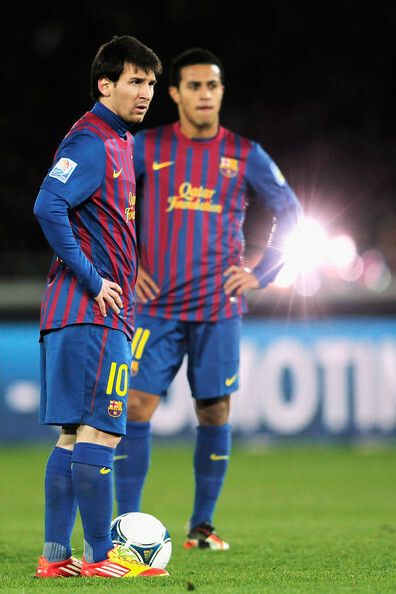 They felt doomed but Messi doesn’t even consider things being piled high against Barca. He has the same look he did when he kicked off. Its as if the ball went out for a throw! Valdes’ mistake in my opinion was just as unfortunate as Marcelo’s deflection (people can argue this for ages but thats not the point) but the response from the set of players right after going down is completely different. Casillas has Iker face, Puyol has Puyol face and is telling the team to forget it and get up! Messi does not even respond, Ronaldo throws his arms up and down as if the worst has happened. I am sure there are more differences. But it doesn’t stop there. This Madrid is Mourinho’s team, the supposed greatest getting-the-best out of his players and instilling mental toughness and focus coach in the world yet Barca were the ones that responded. We as Barca fans are extremely lucky to have this team and Guardiola as coach and that people (Laporta, Pep) made the right decisions even though they were tough. I am sure all of this has already been said here but it doesn’t hurt to emphasize. One of may favorite parts was after the madrid goal..you can see Puyol wave his arms about pumping up his players..What a Captain! Ronaldo throws his arms up and down as if the worst has happened. our players’ mental strength are so much better than them in El Clasico. “Are you, dear reader, wondering how the aftermath of the last super mega derby felt in a Madridista’s skin? I’ll be succinct. Lack of appetite. Alcohol in excess. Endless remorse about poorly kept pre-match superstitions. Constant rhetorical questions about the ability of specific Real Madrid players to rise to the occasion – ‘rhetorical’ as in ‘I already know the effing answer’. Troubled sleep. Recurring fights with girlfriend, who dared to suggest me to switch teams, a comment that can hardly been forgiven, neither forgotten. I both absolutely love that paragraph, as well as kinda hate thinking about Pep leaving the team. That would be a huge blow. (And whatever team he moves to will be my second team thereon). But mostly I really like how thoroughly demoralizing that Clasico seems to have been to the Madrid masses. Though I do think Madrid will win their next game, Go Sevilla! Well – we’re in Germany at the moment, and watching Bundesliga – and thanking the football gods that we get to see La Liga every week. In summary, most of the teams that we’re watching have no strategy to their overall play. There are moments of brilliance when a few passes manage to be successfully strung together to create a good play or a goal, but on the whole, it’s not great. In summary, most of the teams that we’re watching have no strategy to their overall play. Agree with that statement… but… most German teams are very direct. They mostly play a 4 4 2 with people crossing into the box and the forwards heading the ball into the net. Strong big single minded players. Yes, they are boring compared to the La Liga and the kind of entertainment we experience watching Barca and Pep’s tactical genius. But in the end I expect an interesting match because they play direct attacking football that does not exist in La Liga and it will be a different experience for our team and for me as a viewer of the match. I am expecting lots of goals. Couple of headers from them and a boat load of Messi Alexis goals. Yes – I believe that Leverkusen will try to play a fast game against Barca in an attempt to unsettle the Barca defence and capatalise on any mistakes. Schalke was absolutely brilliant and dominated Bremen, winning 5-0. They showed touches of Barca in their play – particularly at the back and midfield. They even played tiki-taka triangles! Raul is the key to the team’s success. He defends, he organises, he attacks and regains so much ball. Then he has the presence of mind to also be a position to score. Tonight he got a hat-trick. But what really impressed me was the atmosphere in the Schalke stadium. The fans were hugely vocal in their support, and each time a goal was scored, the stadium announcer went through a set-piece where the crowd responded with the scorer’s name etc, and finished with the announcer thanking the crowd and them responding with “bitte” which is the German equivalent of the Spanish “de nada” in this context. It was brilliant. The Camp Nou management should well-look to the Schalke stadium for advice and tips on how to engage the Barca fans with a proper stadium announcer, instead of looking to install a “fan zone” which has the potential to bring violence back to Camp Nou. I’ve herd very good things about Schalke stadium. Wow, that must have been a wonderful match. It was capped off by Raul’s usual climb into the fanzone behind the goal area to be interviewed by the fanzone leader and then Raul leads the fans in the Schalke chant. This time he took young Papadopoulos with him, who also scored in the match, while the rest of the team waited on the pitch with a Merry Christmas banner for the fans. It’s a brilliant way for the team to get in touch with their stadium fans. I’ll add that when we lived in Berlin, all that we used to get of La Liga was highlights and summaries of the weekly games, and we used to crave to see more because of the brilliant football that we would see, in comparison to the Bundesliga. Little did we know in those days that we would end up in Barcelona, watching the best team in the world! Ballack is a very physical/dirty/technical player. I remember in one of the matches against Chelsea when Hiddink was the coach, he hacked everybody in our team in the midfield before finally getting carded. I don’t like Ballack at all. What little respect I had for him went out the door after his disgraceful behaviour after Chelsea lost the return CL match against Barca in 09/10. I’m sure that he had a great influence on Drogba as well and turned him into a whinging dirty player while Ballack was at Chelsea.